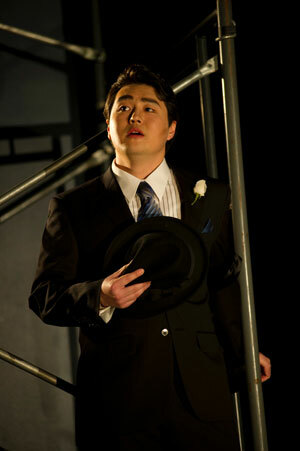 Andrew Stenson as Don Ottavio in last season's Young Artists production of Don Giovanni. Andrew Stenson received a wild roar of approval from the crowd after the Sunday matinee performance of Orphée et Eurydice a week and a half ago, when he sang Orphée, as cover, because William Burden had been injured at the previous evening’s performance. Melinda Bargreen, who reviewed that performance for KING FM, agreed with the surprised and delighted audience: “Stenson commands an apparently limitless range, a highly developed vocal agility with remarkably good trills, and a passionate conviction that reaches right into the house,” she wrote. Stenson, who’s starring as Ernesto in our upcoming Meany Hall performances of Don Pasquale, spoke to me the other day about how crazily high the role of Orphée is, about his recent Metropolitan Opera debut, and what he’s learned from two years in our Young Artists Program. First, tell us about about your experience in Orphée et Eurydice. Covering Bill [Burden] in Orphée was fantastic. Bill is amazing, he’s able to get up there and do it once, and it’s brilliant. That takes years and years of training, and a lot of discipline and talent. For me, just to be able to be around that really pushed me to be better. He’s so natural and comfortable in his body, that really challenged me. When he takes this kind of posture, or does certain things with his body—you can pick those things up after observing. A lot of little things, and how he’s able to turn on a dime. There’s a moment—I think it was just before intermission, where he literally sang while lying on his side, with one of his legs curled up—the weirdest position I’ve ever seen anyone sing from! Yes, in the Elysian Fields scene. Did you use the same posture? I did, but I remember, “God, that’s really hard!” (laughs) I took that blocking directly from him, but he just...did it. It’s actually really fun to be able to challenge yourself like that. 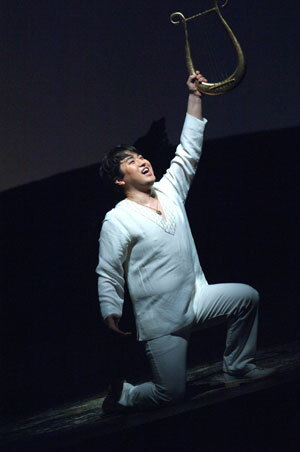 Like with the aria at the end of Act One, “L’espoir renait”—singing coloratura while holding a lyre above your head. After a while, that gets tough. Because your arm gets tired? Yes. The first time I sang the role, my arm was so sore the next day! Try being a conductor! Now tell us about the tessitura--the vocal range—of Orphée. Andrew Stenson (Ernesto) and Amanda Opuszynski (Norina) in rehearsal for Don Pasquale. Had they [Seattle Opera’s artistic staff] heard you sing “Ah, mes amis” from Daughter of the Regiment, with its famous 9 high Cs? You’re like a male version of those Queens of the Night who warm up with their aria. If you’ve just sung a high F, then a high C isn’t so high! The first time I sang the Daughter of the Regiment aria in public was at the Tucker Foundation auditions, and it that was the best audition of my life—I actually won one of the study grants. That’s very exciting. As was your recent Met debut, back in January, when you were covering a singer in The Enchanted Island and ended up going on. That’s happened to you twice this year! Tell us about that role. Yes, the character was simply called Quartet # 3. It’s an haut-contre role, like Orphée. That opera is a pastiche by a bunch of composers. Who wrote the music you sang? I sang in a quartet by Rameau, “Tendre amour,” look it up on YouTube, it’s really beautiful and harmonically quite ahead of it’s time. Originally it was supposed to be really high, that’s why I got hired. But then our Maestro, William Christie, decided to transpose it down a major 3rd, so I thought, “Oh, the singer I’m covering could sing this cold, I’m never going to go on.” But then he ended up with tonsilitis, and they call me the day of the show—early, it wakes me up, I’m like (groggy voice) “Hello?” And they say: “You’re going on tonight,” but I fall back asleep for two hours and when I wake up I’m not entirely sure whether the call came or I dreamed it. So I call back, and they say, “You can’t back out on us now—you’re going on!” I’d already been fitted for the costume, and then during intermission the Assistant Director showed me where I needed to be onstage when, I ran it the quartet musically with the other three—we’d never sung it together before—and then I went out and did it. Funny story, in Seattle I live with Lindsay Russell and Sarah Larsen, two other Young Artists, and when they heard I was going on they called another friend who was in that show and they told him to leave cured meats in my dressing room, because they thought I would appreciate that more than flowers. They were Face-Timeing in the Met Green room through his phone, watching it on the monitor, and I came offstage and there they were, it was really sweet. Sarah Larsen (Charlotte) and Andrew Stenson (Werther) in Werther. Moving on to Don Pasquale, how does the role of Ernesto sit in your voice? It’s high, but it’s different. Here, the Bbs are events! The phrases are longer than those in Orphée, the gestures are bigger. I’m glad I did Orphée first! The way we’re doing it, the comedy comes from how seriously Ernesto takes himself. He’s a bit melodramatic. But it can go either way, you could take him seriously or no, and I leave that up to the audience. I hope to portray the character honestly. It could be funny, it could be heartbreaking. I relate him to Ted Mosby in How I Met Your Mother—he gets so riled up! For you, what’s the difference between playing tragedy and playing comedy? The unfortunate things about tenors in comedies is we’re usually the straight guy in the comedy. Pasquale is the ridiculous one, Norina is quirky, or sassy, and Ernesto is the straightforward one of the bunch. I discovered this last fall when we were doing Viva la Mamma!. You can’t play for laughs—compared to Mamm’Agata, you’d never win. That was a very good experience, in terms of preparing me for this. 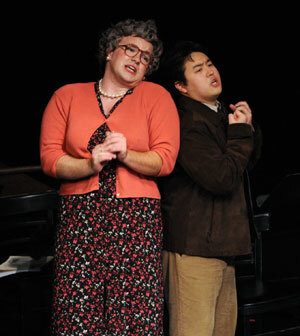 Daniel Scofield (Mamm’Agata) and Andrew Stenson (the Tenor) in Viva la Mamma! Speaking of that fall 2010 tour of Viva la Mamma!, you’re now wrapping up your second year in our Young Artists Program. What have been some of the highlights, so far, of your work at Seattle Opera? It’s been so much fun, I’ve done so much with this company. Right now, it’s home. I feel like the company has my back, and I can’t thank Seattle Opera enough. I’ve learned so much, I feel like I’ve been taking leaps and bounds forward with all the opportunities I’ve been given here.